Kids can collect multimedia resources and combine them into a personal documentary video about themselves. I am a big fan of Curious George storybooks. For kids ages 3-5, George is easy to relate to. My app pick for today is an interactive app that lets you build your own stories starring your kids and Curious George, called Curious About Me. There are two stories that you can build: Curious About Me and Day at the Zoo. In the first story, you can build a portfolio about your kids and their favorite activities, whereas in the second story, you can build a documentary of Curious George visiting your private zoo. Both stories require your kids to take a selfie and type their names. When they create their own portfolio videos, they can choose their own hairstyles and eye colors. They can also select one of many activity options as their favorite. For example, they can choose drawing/painting or making music. Then, they can import existing pictures of their parents and siblings to create a family photo album, before finishing up with a drawing of their favorite animal and the house where they live in. When all these multimedia resources have been completed, the app will generate a short video that tells the story in a fun and cohesive way. For example, you will hear the narrator saying your junior’s name and what he/she likes to do. On the other hand, you can also hear your junior’s own voice mentioning his/her own age. For the second story, your kids can color the butterflies, fish, and starfish, record their own voices mimicking the lion’s roar and a parrot’s chat, and take silly selfies. You can also help record videos of them flapping their hands like a bird, or hopping like a rabbit. They can also import a photo of their favorite meals and draw an imaginary animal that they wish to include in their private zoo. Once everything is ready, the app will generate another short video documenting what Curious George is doing when he visits your kids’ private zoo. Based on my experience, your kids would want to re-create the experience by taking new selfies, coloring the animals differently, and even recording different videos of them mimicking the animals. Kids can select their own favorite activities to be included in the video. All the stories that you have created will be saved automatically, but you need to save the generated videos manually. They will be stored in the Camera Roll, allowing you share them with your friends and families. Curious About Me allows you to create multiple profiles. You can assign each profile with ages from 0 to 10. I wish the developers would loosen things up by allowing us to create profiles of other family members. My three-year-old really wants to create a profile of his mom and his grandpa, but he can’t assign the appropriate ages for them. Kids can color animals, draw their home, and record their own voices to make their videos feel more personal. If you’re a videographer, you’d know that the approach taken in this app quite resembles what a professional video journalist would do. They would do an interview, record their narration, collect photos and videos, and let the interviewee perform their favorite activities. Then, they would mix and match these multimedia resources into a nice-looking documentary. Curious About Me encourages kids to express their uniqueness and interests in a way that’s both easy to create and easy to visualize. I really like how the app includes a few open-ended questions to let kids communicate and express themselves freely. You can also create a documentary of Curious George visiting your private zoo. Curious About Me is suitable for kids ages 3+ who’d love to build their own stories. 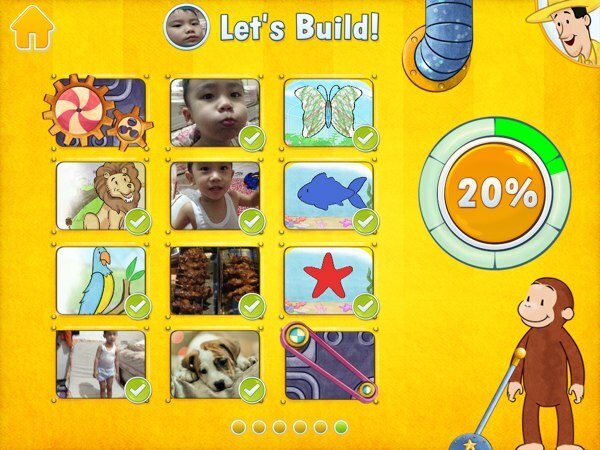 With this app, they can build their own portfolio videos and watch how Curious George would enjoy himself when he visits the private zoos that they have created. It really is a fun and easy way to create, experiment, and celebrate your kids’ creativity, uniqueness, and interests.